17 000km, 146 days, 10 countries: Cape Town to Kathmandu - Mission accomplished! WATCH: Retired Land Rover employee reunited with Landy she worked on 70 years ago! After nearly 17 000km, 146 days and 10 countries, Kingsley Holgate and his fleet of Land Rovers have successfully reached Nepal and completed their arduous, trans-continental Cape Town to Kathmandu expedition. Shortly after conquering the precarious mountain passes of the Karakoram Highway, Holgate and crew exited Pakistan and crossed India for the final leg of their journey. The expedition team drove their two Discovery's and trusty Defender 130 across the Wagah-Attari border, famous for its Beating Retreat ceremony where thousands of spectators on both sides arrive to witness a colourful parade of soldiers who lower flags and closed border gates in perfect coordination every day before sunset. The crossing wasn’t entirely smooth sailing, however, as Indian customs officials spent three hours searching every inch of the three Land Rovers and their contents. Each car was also driven onto ramps to inspect for explosives, but once satisfied all was in order a friendly official waved them through and wrote "Welcome to India" on the Madiba100 Scroll of Peace and Goodwill, which was on its way to representatives of Kathmandu as a symbolic gesture friendship from the people of South Africa. 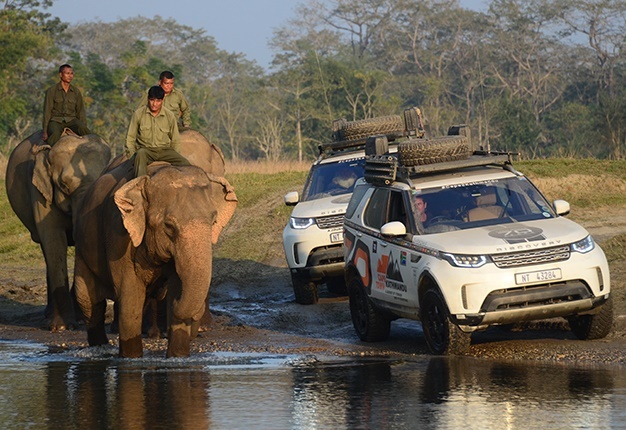 "On previous Land Rover expeditions, we’ve faced the gridlocked traffic of overcrowded cities such as Cairo, Kinshasa, Lagos and Nairobi, but nothing prepared us for the chaos, pandemonium and sensory overload of driving in India," said Kingsley. "But it was all worthwhile when we stood at the famous World Heritage Sites of the Golden Palace in Amritsar, the Red Fort of New Delhi and observed the poignant beauty of the Taj Mahal in Agra, which Rudyard Kipling referred to as 'the embodiment of all things pure'," he added. With the end in sight, the team pushed north and crossed into its destination country of Nepal. From Lumbini, the birthplace of Lord Buddha, the vehicles cruised east to the jungle wonderland of the Chitwan National Park and zigzagged over one final Himalayan mountain pass choked with trucks and kamikaze buses. "Once again, it’s the incredible handling, braking and acceleration of the Discovery's that got us here safely. They seem to be born for these types of road conditions. Despite the long and challenging journey, we’re all upbeat. Kathmandu is finally a reality," said Kingsley. The team received an emotional welcome in the Nepalese capital city. With lights flashing, a Nepal Tourist Police vehicle escorted the three expedition Land Rovers to the 600-year-old, high-domed World Heritage Site of the Boudhanath Stupa – the holiest Buddhist temple in Kathmandu – where they were welcomed by a group of school children waving South African and Nepalese flags. A robed Buddhist monk, Khenpo Dorje Lama, lead forward a welcoming delegation that included the South African Honorary Consul Mr Pradeep Shrestha, directors from the Nepal Tourism Board and Jack Edwards and Marie Jensen who helped with community work at Chitwan National Park. As press cameras clicked and flashed the crew was presented with colourful Nepalese scarves and traditional hats. In the true spirit of Ubuntu, the Madiba100 Scroll of Peace and Goodwill was endorsed with warm, welcoming messages. "To all the expedition members: thank you for your great work and the love and joy that you spread across the continents. "I strongly believe that this special expedition has been guided by the spirit of the great leader Nelson Mandela, with his stance for morals and equality, that you chose to end the expedition in Nepal, the birthplace of Lord Buddha - the apostle of peace," wrote Ms Nandini Lahe-Thapa, senior director of the Nepal Tourism Board. 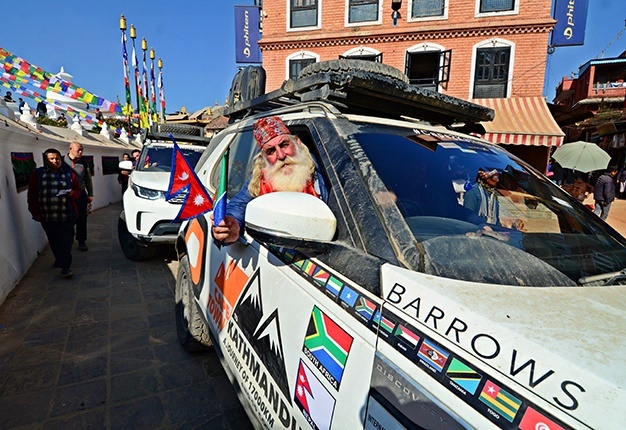 Special permission was given for the three Land Rovers to do a spiritually clockwise lap of honour around the Boudhanath Stupa and later, there was an exchange of South African and Nepalese flags followed by a traditional feast. "I look at the travel-weary faces of the expedition crew who, sometimes against all odds, have made this world-first Land Rover Discovery journey possible. As the adrenaline drains from my body, I feel an overwhelming sense of relief that we all got here safely. So much could have gone wrong," concluded Kingsley Holgate. "There have been some tough security situations and on some of the mountain passes, one mistake and we could have easily plunged to our death. I’m also grateful to Land Rover and our other supporters that once again and wherever possible, we’ve been able to link this adventure to improving and saving lives, and that our conservation community education programme continues to engender a passion for wildlife amongst the youth," he added. "The grandeur of the landscapes and the world’s highest mountain ranges – the Himalayas, Hindu Kush and Karakorams – and all the wonderful people we’ve met along the way who helped push this expedition forward; not forgetting the two Land Rover Discoveries and our big Defender 130 'mother ship'. "All said and done, they are the true heroes of this trans-continental journey from the tip of the African continent to the top of the world. Hope does indeed cross any terrain," Kingsley said. "This kind of overland voyage demonstrates perfectly that our Discovery can live up to its name," says Tina Pienaar-Smit, Sponsorship Manager, Jaguar Land Rover South Africa and sub-Sahara Africa. "We’re proud that Land Rovers have once again delivered Kingsley Holgate safely to one of his fantastical destinations. We’re even more proud of Kingsley, who represented our products with passion and led his world-class team across the globe on another extremely impressive adventure. We can’t wait to hear what’s in store for the next one," she concluded.